The innovative Bar-Code system has conceptually been conceived as a close cabinet, even though there are no doors; it is composed by vertical containers which, by sliding on a floor base, disclose the possibility to be physically ‘in’ the furniture. The containers, available in different sizes and in an ample range of colours and finishing, can be differently combined to create new and harmonious furnishing solutions. 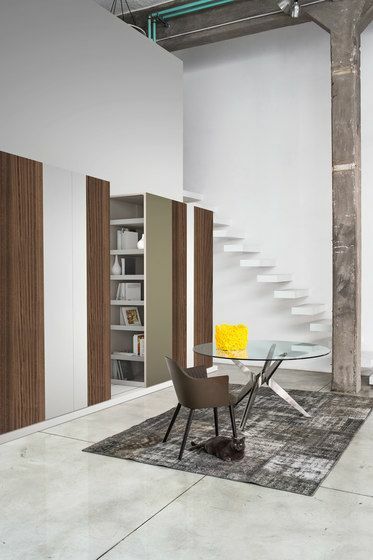 The extraordinary, versatile collection, consisting of bookcase, wardrobe and sideboard, is well suited for multiple environment settings: from living areas to night areas of sophisticated homes, to the furnishing of offices and commercial spaces. In addition to the more traditional use, by the wall, it can also be a support cabinet island or act as true partition wall. Elegant and versatile, Bar-Code is first a bookcase and later a wardrobe with a wide range of composition solutions and high retention capacity. It addresses to a very demanding public in terms of design and quality of materials and its peculiar characteristics make it an eclectic complement of modern design, refined and cured right through its minimal detail.